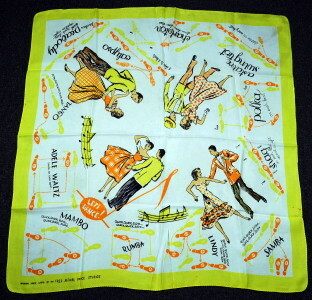 1950's vintage LET'S DANCE, dance step motif square-ish scarf. White and golden yellow with orange rayon crepe. Rolled hem edges. 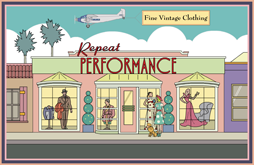 Motif includes vintage dancers demonstrating dance steps for the MAMBO, SAMBA, RUMBA, LINDY, SHAG, ASTAIRE SWING TROT, CALYPSO, PEABODY, and TANGO!! All original 1950's vintage. A swing dancer's dream! Very good condition. Shows a few small professional weave repairs, some tiny pin holes and some soil marks. Not perfect, but strong textile and totally wearable.